There has recently been a lot of talk in the news about Gold Star families, Purple Hearts, and military service. I knew very little about all of these things until my son decided to join the Marines in 2005 and was commissioned as an infantry officer in 2009. And now, several years later, as I read the news and recall his deployment to one of the most dangerous parts of Afghanistan, I continue to be thankful for his safe return, and I have been flooded with painful memories of what it's like to be a parent of someone deployed in a very dangerous place. This is my story—it may resonate with others, but it's just one mom's account. When your son or daughter is in a combat zone, you do not sleep except with a telephone next to the pillow. You can't decide if you should obsessively follow the news or avoid watching the news. You break into sobs while driving down the highway. You can't listen to country music songs about Arlington Cemetery, you have unaccountable fits of anger when a well-intentioned person asks if the troops get to come home for the holidays, and you hear your child's voice via a static-filled satellite phone line only once in eight months. You don't want to look at the scary folder with the documents he had to sign, with his power of attorney and his life insurance policy designating his sisters as his beneficiaries. You know that someone in the battalion has been killed when all outgoing emails are shut down so that the bereaved family can be notified, and you swing between sadness for them and terrible relief that it's not your child. On the eve of my son's deployment, I found MarineParents.com to be my savior, because I needed the support of other parents with a child in the military, and I had almost no one in my social circle who was in that position. What a godsend the Marine Parents message boards were—first as a clunky message format, then as our current Marine Family Network group format. At the height of the Iraq and Afghanistan conflicts, there were online message boards for parents and other Marine family members, some sorted by topic, and others sorted according to individual battalions. We parents who were in discussion group of my son's battalion did not know one another and would never meet in person, but we could figuratively "hold hands across the Internet" as our children flew in to one of the most dangerous villages in Helmand Province, where the Marine battalion would suffer 25 deaths over the course of the deployment. I have never felt such a connection to total strangers as I did in these months. We could divert our attention from our all-consuming fear during those eight months by chatting about care packages and birthday messages via "Moto-mail" and what color socks the colonel was allowing the troops to wear—white was the color preferred by the Marines themselves, but it did not meet uniform regulations. There was a participant in our ongoing discussion about putting socks in care packages who stood out because of her lively comments and upbeat attitude. Her son was an explosive ordnance disposal specialist. The day after she posted a comment about mailing socks, we read that this mom's son had been killed by an IED. I kept thinking about the khaki socks she had selected that her son would never need. In a blink of an eye, she had moved to the elevated, and dreaded, status of the Gold Star mother, someone whose child has died in battle. She could avail herself of the love and sympathy of those who posted condolences on the message board and could commune with other Gold Star parents in the private Gold Star forum on the Marine Parents website, although whether or not she did so or found it helpful, I never knew. We in the discussion group never heard from her again. During my son's deployment I was looking for more in-person support, so I began volunteering the Marine Parents outreach group in Bethesda, Maryland, then called Purple Heart Families East. Our main mission at that time was to serve Sunday dinners on the hospital floor and provide comfort to the dozens of parents of newly wounded warriors, many of them Marines, who were flooding into Bethesda Naval Hospital. Often their injuries required multiple amputations. The parents and young spouses were often scared and lost, having traveled suddenly from homes across the country on very little notice to be at the bedside of their loved one. They were facing an uncertain future and the knowledge that they would be juggling family, jobs, and travel, living in the Navy Lodge or the Marriott in Bethesda for many months. 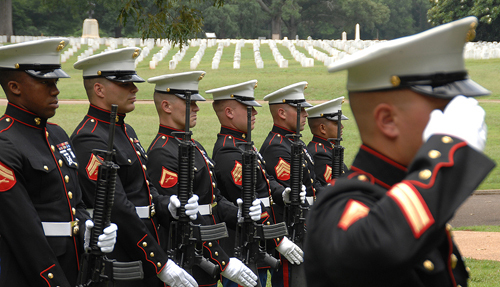 Marines render a salute to a fallen service member during a funeral service at Andersonville National Cemetery, Andersonville, Ga., June 10, 2016. It was then that I also began to meet Gold Star parents. I learned the first and most important thing one can say to a grieving parent is, "I'm sorry for your loss." And I also learned that parents of wounded and deceased Marines want to talk about their child, his or her operations, how they were wounded, whether they have a spouse or child, and where they come from. They don't want to have people skirt the issue that is most on their minds. Their greatest fear is that their child will be forgotten and that his or her sacrifice will have gone for naught. We have a special term, really a euphemism, for members of the military who fall in battle. We say they "made the ultimate sacrifice." The word "sacrifice" is from the Latin, "to make sacred." We citizens must MAKE the death sacred, otherwise it's just a meaningless, unhappy occurrence somewhere far away. Our nation needs to elevate the deaths of those who die in uniform, serving us. And, for the most part, it does a good job. It is the duty of our country to accord bereaved military families special honors, and a special status. A healthy nation develops language, and ceremonies, to honor those who have died in battle. It provides them with special cemeteries and burial rituals. And it reserves a special place for their loved ones in its heart. Death is not sweet, even if it occurs fighting for one's country. But we need to honor those who are willing to take on that challenge, and have the grace and maturity to step aside from partisan politics for a moment to remember to be grateful. Susan Kristol's son is now on inactive reserve. She manages the Marine Parents Warrior Support Team outreach effort at Walter Reed National Military Medical Center. This blog is a revision of a longer article that appeared on August 2, 2016, in The Federalist, an online magazine.